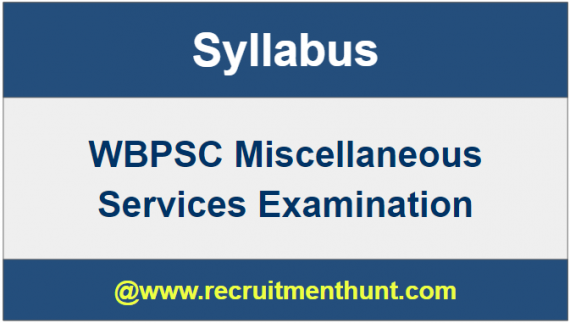 WBPSC Miscellaneous Services Syllabus: Candidates who are searching for WBPSC Miscellaneous Services Syllabus PDF have reached the correct location. Here, the individuals can get complete WBPSC Miscellaneous Services Syllabus along with the latest WBPSC Miscellaneous Services Exam Pattern. Therefore, the aspirants must check WBPSC Miscellaneous Services Syllabus and WBPSC Miscellaneous Services Exam Pattern before starting the exam preparation. The WBPSC Miscellaneous Services Previous Year Question Papers PDF has also been uploaded on this page. So, the candidates can download WBPSC Miscellaneous Services Solved Previous Papers from the below sections. The contenders who are going to giving the examination on the exam dates should need to refer the full topics that what are the subjects are covering overall will be explained in the below sections. For more details regarding WBPSC Miscellaneous Services Examination, you can visit our site i.e www.recruitmenthunt.com. West Bengal Public Service Commission has recently released notification for conducting WBPSC Miscellaneous Services Exam 2018 to fill up the Block Welfare Officer, Assistant Programme Officer, and Other Vacant Posts. So, the individuals who are eagerly waiting for Govt Jobs in West Bengal have been applied for this WBPSC Miscellaneous Services Recruitment 2018 through Online. Now we advise all the applied candidates to download WBPSC Miscellaneous Services Syllabus and WBPSC MS Exam Pattern for the perfect exam preparation. The applicants can get detailed WBPSC Miscellaneous Service Syllabus from the below sections. Here is excellent news for all the individuals who are preparing for WBPSC Miscellaneous Services Exam 2019. We have provided the topic wise WBPSC Miscellaneous Services Syllabus and tabulated WBPSC Miscellaneous Services Exam Pattern here which are very much helpful for the exam preparation. Therefore, the candidates can download WBPSC Miscellaneous Services Syllabus & Test Pattern on this page. Also, download WBPSC Miscellaneous Services Model Papers from below. The WBPSC Miscellaneous Services Exam Pattern and WBPSC Miscellaneous Services Syllabus plays an important role in the exam preparation. Only through the WBPSC Miscellaneous Services Test Pattern, one can know the test type, test duration, weightage for each topic etc. By knowing all these details, the candidate’s preparation becomes much easy. Therefore, it is very important for the candidates to check WBPSC Miscellaneous Services Syllabus and WBPSC Miscellaneous Services Exam Pattern before going to start the exam preparation. The WBPSC Miscellaneous Services Prelims Papers comprise of 100 objective type questions for 200 marks. In WBPSC Miscellaneous Services Mains Exam, there will three papers – Paper 1, Paper 2, and Paper 3. Paper 1 and Paper 2 will be for 150 marks each and the exam duration is 90 minutes each. Paper 3 will be for 150 marks for 150 Minutes. The complete subject wise WBPSC Miscellaneous Services Syllabus is as follows. Therefore, the complete and latest WBPSC Miscellaneous Services Syllabus and WBPSC Miscellaneous Services Exam Pattern have been enclosed here. So, the applicants can easily avail WBPSC Miscellaneous Services Syllabus & Test Pattern from this site. Finally, here all the aspiring candidates can now check the WBPSC Miscellaneous Services 2019 for free cost. Also, Interested individuals can download WBPSC Miscellaneous Services Cut Off Details, WBPSC Miscellaneous Services Result Date, WBPSC Miscellaneous Services Result 2019 Expected Date etc. And for more information about the WBPSC Miscellaneous Services Exam 2019 candidates keep searching our site Recruitment Hunt.